Every man who reaches a certain age will find his attention turning to sheds, and I am certainly no exception. We’ve had one built at the end of our garden, chiefly to house my bicycles – and oddly enough, it has had a liberating effect on my life. The bikes are no longer needy house guests forever dripping oil on our floorboards and peeking out at me from the spare room. I can now wait for the urge to get out on my bike, rather than feeling subconsciously goaded into riding by catching sight of my bikes every time I cross the hallway. A purpose-built security shed complete with five-lever locks and a couple of concreted-in ground anchors was by far the most expensive solution to storing the bikes, but it offered the fewest compromises. An Asgard metal locker would have taken up too much space in our little garden, and fitting one inside our old rickety shed would limit storage space. And besides, any reasonably intelligent thief probably knows those types of lockers contain bikes just by looking at them. So a massive, windowless shed that gives no clue to its contents (while still looking reasonably pleasant and ordinary) was the best option. Naturally, I picked the most secure ground anchors and the strongest chains I could find. 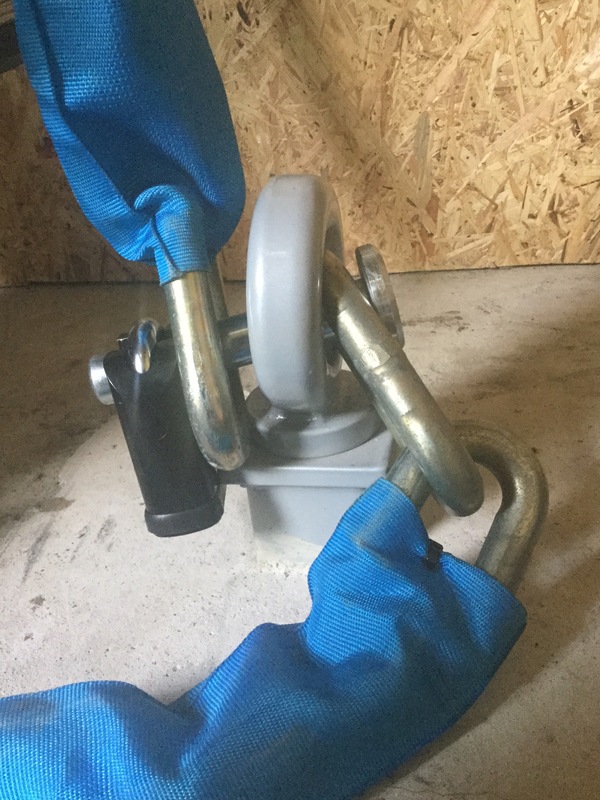 The only problem is they aren’t compatible – the links of boron steel Protector Chains are too wide to fit through the hole of Mammoth anchors. I thought I would have to switch to a smaller, weaker chain until David at Security For Bikes provided a solution in the form of a brilliant little device called an Anti-Pinch Pin, which is basically a giant steel rivet that has a thinner section near its tip. You put the pin through both ends of the chain with the anchor hole sandwiched in the middle, then clamp a Squire high-security padlock snugly over over the thin part of the pin to lock the chain in place. David was immensely helpful, looking at a photo I sent him of our shed and helping me work out a solution through a series of emails after I had bought two Protector Chains from him and discovered they didn’t fit. I can’t recommend them highly enough, so check out their website if you’re thinking of upgrading the security for your bicycles.